Puckhandlers Roller Sports Stadium is the first dedicated inline hockey rink built in Australia. Initially when we set out to start the rink for 'hockey only' many of those involved said we were "Crazy". In retrospect we were a bit nuts but luckily through a bit of hard work coupled with some good luck we have managed to make the place a tremendous success. The goal of the rink is to create a safe, fun, social atmosphere where kids and parents can come to have a skate and enjoy our services. The rink is designed for inline skating but the underlying goal is to create a bigger, better inline hockey base. Each person who walks through the front door hears about inline hockey one way or another. Inline Hockey is on the way to becoming a huge sport in Australia and Puckhandlers Roller Sports Stadium enjoys being a central part of it. The sport is growing everyday and has never been in a stronger position than it is now. The present ILHV (Inline Hockey Victoria) executive committee is excellent and with the help of Rodney DeBoos and Bruce Beatson , it will continue to grow and prosper. If you, or anyone you know would like information on inline hockey, contact the rink anytime and we will be more than happy to assist you with all relevant details. The rink is also in the process of developing a new sport 'Box Lacrosse'. The sport is huge internationally and growing strongly in Australia. The A S C - directors, Ross Fisher and Karl Bryan. Ross has a background in Aussie Rules football, playing 5 seasons with the Melbourne Football Club. On his impressive dossier of sporting achievements is an AFL Reserves Premiership. Since leaving football he has taken up a new sport, inline hockey. 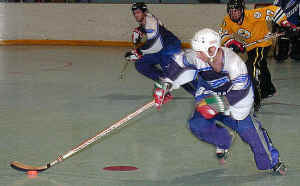 Amazingly after starting the sport at the age of 33 he has managed to carve himself quite an impressive inline hockey career, he is a dominant player in the A grade competition, was the highest point scorer in A grade in '01 and is the captain/coach of the defending champion Geelong Bisons. Ross is also a stand out player in the Pro Hockey League for the Bauer Reservoir Dogs as an enforcer and defensive forward. When his four children started playing with the Eltham Eagles in 1995, Ross saw enormous potential in the sport and felt there weren’t facilities available to compliment the players abilities (Maybe that is because he was used to the MCG!). He secured Sullivan Sports Centre, teamed up with Professional Hockey Coach Karl Bryan, and the rest is history and we now have Puckhandlers Roller Sports Stadium. Hailing from Canada, Karl Bryan’s background is in marketing and ice/inline hockey. He attended Red Deer University in Canada where he completed two years of Business with a Grade Point Average of 3.3 (82%). 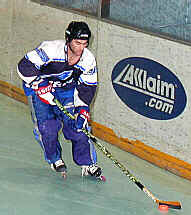 He arrived in Australia in 1993 and soon after started playing ice and inline hockey in Melbourne. After playing the two he felt that inline hockey had enormous potential and helped form a new club, The Phantoms. He transferred to the Kings so he could play with good mates Johnny T and Jon Moses and organized for Ballistyx to sponsor the club, renaming it The Ballistyx Bulldogs. He soon took on inline hockey full time and organized inline hockey clinics and holiday hockey schools. The success of the schools led to him traveling around Australia doing inline hockey camps, referees courses, coaching clinics, and even goalie schools (if you have seen him playing goal you’ll think this is amazing!). Since this time he and Rossco have launched the Australian Skate Company and he now works out of the home base at Puckhandlers Roller Sports Stadium. Karl has also developed a tournament serries in Australia called the"Silver Cup'. These tournaments started three years ago with eight teams and mis matched jerseys, it is now a major event on the Australian inline hockey calendar. In 2001, 91 teams will have participated in a silver cup event! Karl has an impressive hockey dossier, some of his recent achievements include, highest point scorer at Australian Open Nationals three consecutive years ('98,'99,'00), a member of the Victorian National Champions seven consecutive years (not losing a game during this time), highest point scorer of the Australian Club Challenge '01, Most Assists award Australian Club Challenge '01, highest point scorer Pro Hockey League '99,'01 as well as being Captain/Coach of the reigning Champion Pro Hockey League Team the Bauer Reservoir Dogs.